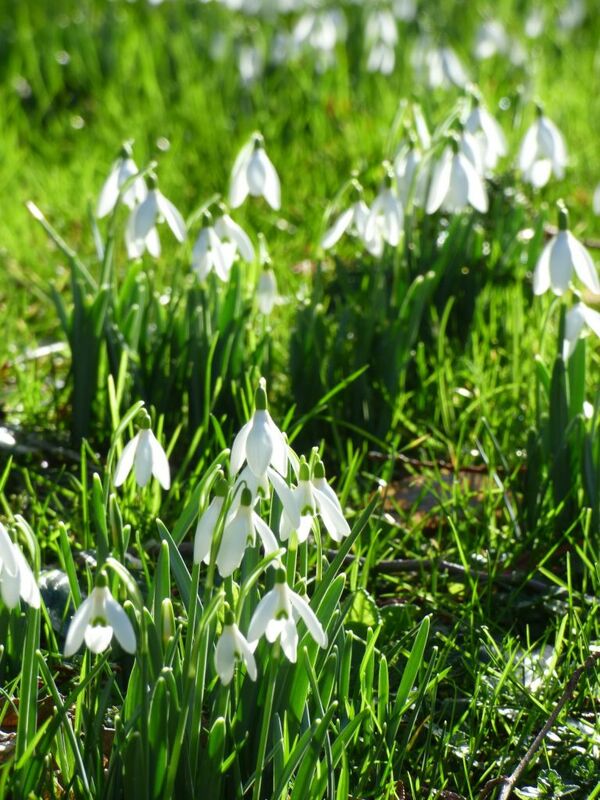 It is snowdrop season here again, and as usual I have been looking for ways to bring their delicate beauty indoors. You really can’t pick snowdrops, they are so small and delicate, they fade into insignificance once in a vase. 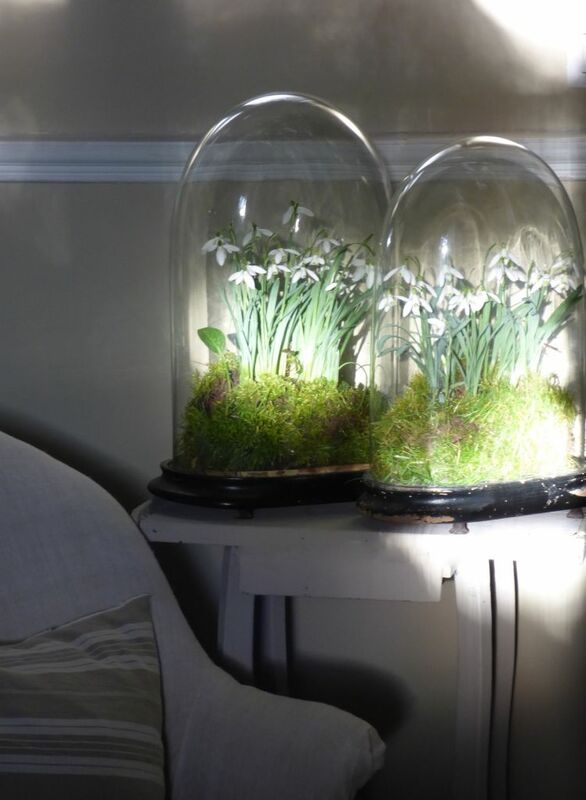 Here is what I came up this year, snowdrops under glass! It took longer to take the photos than to arrange the snowdrops, but I think it’s a nice way of bringing the outdoors inside just for a couple of days. 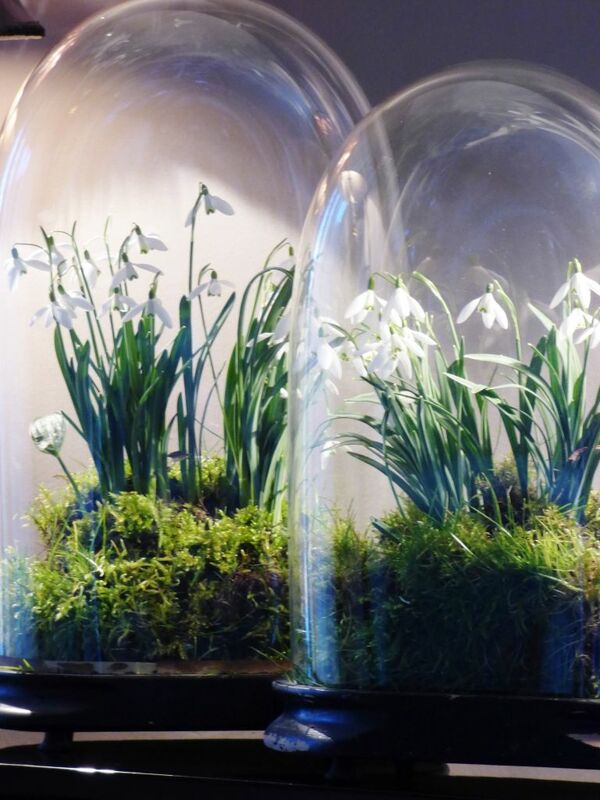 I simply lifted two clumps of snowdrops, earth and all, and placed them in a shallow dish that was the right size for my glass domes. Coaxed them gently into position then covered the outside of the dish with moss. the brocante store is now open! Sharon – what a lovely way to start my morning. We have no snowdrops in our patio pots, but these photos tempt me to go to our favorite nursery to see if they have any. They are certainly the first harbinger of spring. You have found a unique and beautiful way to display them inside. Thanks for the inspiration. A study in beauty and elegance. I think you found the perfect way to bring this delicate flora inside! I will give this a try when spring arrives here in Princeton, NJ. I bought the lipstick from your Polyvore boards! Beautiful Sharon! Lovely idea, I hope this means spring is coming! Aw…those snow drops are just beautiful..alas no snow drops here in San Diego but I can pretend with white cyclamen…cheers to you and thanks for the beautiful pics..
What a great idea. 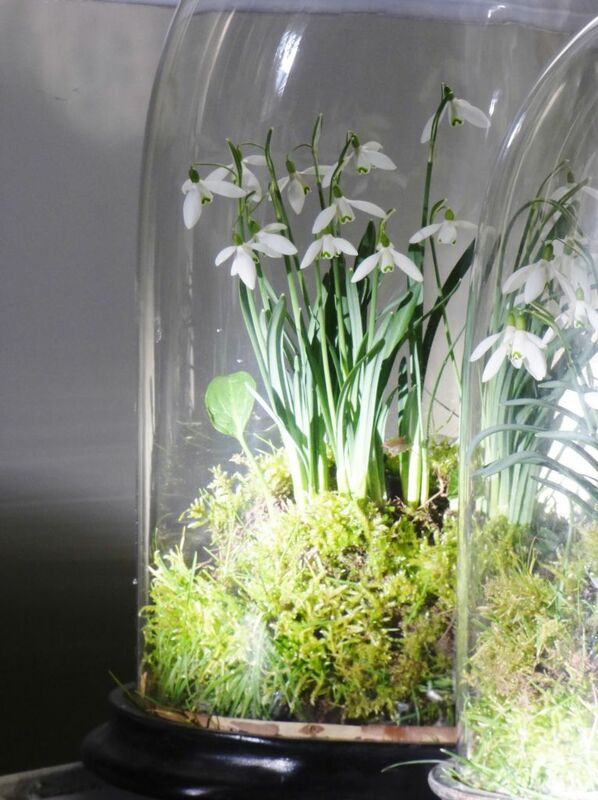 I have some beautiful snowdrops and a glass dome. Thank you. And the grass is such a vibrant shade of green. Here comes Springggg! Now that is thinking outside the box! Love the idea. We are coming out of a long hot hot summer so it will be ages before I can try this for myself. Rollon autumn, winter and then spring!! I was feeling pretty sad because I have never seen snowdrops, then I saw the comments from Lin and from Colleen Taylor, and felt better. I’ll pretend with cyclamen, also. I am now in Baja, Mexico, just across from San Diego, I guess we’re deprived, huh, Lin? Something magical happens in the garden when snowflakes are in flower. I have them in clumps at the front they are very generous with their flowers. Hi Sharon we are heading for Autumn so I’ll be looking forward to your beautiful floral displays in the next couple of cold months. Thank you for sharing beauty. Regards Esther from Sydney. Snowdrops such a pretty little plant, and there is expectation of better weather to follow. Brilliant idea! They look SO PRETTY!!! Sharon what a purely delightful way to bring snowdrops indoors. I love to see them peek their heads up telling us that spring is not far off now. These and primroses are the first beauties after Christmas. I always look for primroses in the grocery store in January. They are not too fond of being inside but I found with a deep kitchen window near Blessed Mother they are thriving this year. What a delightful way to display the sweet snowdrops. With lots of snow on the ground and temperatures only in the 20’s this coming week, I so enjoy seeing signs of spring elsewhere. I love what you did! 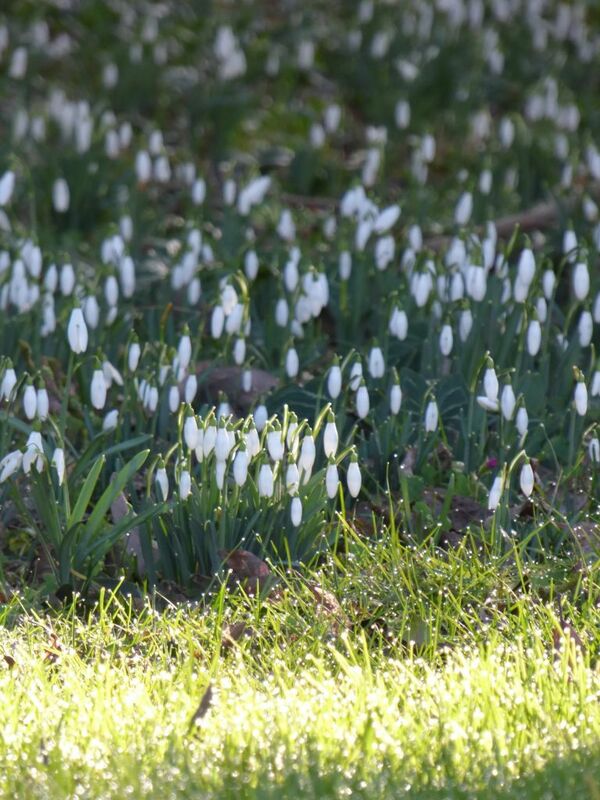 Darling little snowdrops…. Thank you for brightening my Sunday! Haven’t visited your beautiful and interesting blog for a while. These are lovely pictures of lovely little flowers. Made me smile..thanks. Have nice w/end. That is absolutely brilliant! Gorgeous! If you ever want to change careers, your flower arranging is so spectacular, I am sure you could open a store and be very busy. What a beautiful idea and way to display something so delicate and lovely.